Farm Design - The Summerland farm design process is now shifting into the implementation phase and the installation of our regenerative systems. Be on the lookout for opportunities to visit the farm in the coming months. Training Program - Our Regenerative Land Stewardship Training Program is unfolding with in-depth study this week at Chico State and two Holistic Management trainings before the year’s end; look for the release of the full training program offerings in early 2019. Products - Our exemplary product development team has been hard at work preparing for our first regenerative based, value-added food product. I can’t share more on this yet, but we are committed to bringing these options to the market and will be doing so in 2019! Our website is now live and offers more in depth content on our work and shares the story of our roots. Please check it out and be sure to share it with a friend. Lastly, I want to say thank you to all who have been so generous with their time, knowledge, and financial donations. Our team takes great pride in utilizing each contribution to its maximum value and building a broader and deeper regenerative community through our work. A diverse, multi-layered canopy, overstory and understory within the existing avocado orchard. Our approach is to first stump the avocados that have a canopy height that is too tall, and therefore difficult to manage, or has excessive dead biomass, and therefore has limited potential to produce healthy crops. Through our ‘stumping’ process, we are breaking down the biomass to provide ground cover, as well as to build retention basins around the trees that will create a ‘sink’ for nutrients and moisture to support the tree’s regrowth. With the canopy now open, we are able to increase the orchard density and diversity by introducing additional trees, shrubs, grasses and groundcovers in the interstitial space. Our intention is to increase the aggregate yields from the land, while also reducing the water needs through earthworks that increase the water holding capacity of our soils. Greetings from the Director of Learning and Engagement. Another month has passed and of course, there is so much to share! Find out what's happening and what's to come as we continue to build our regenerative movement in Central and Southern California. 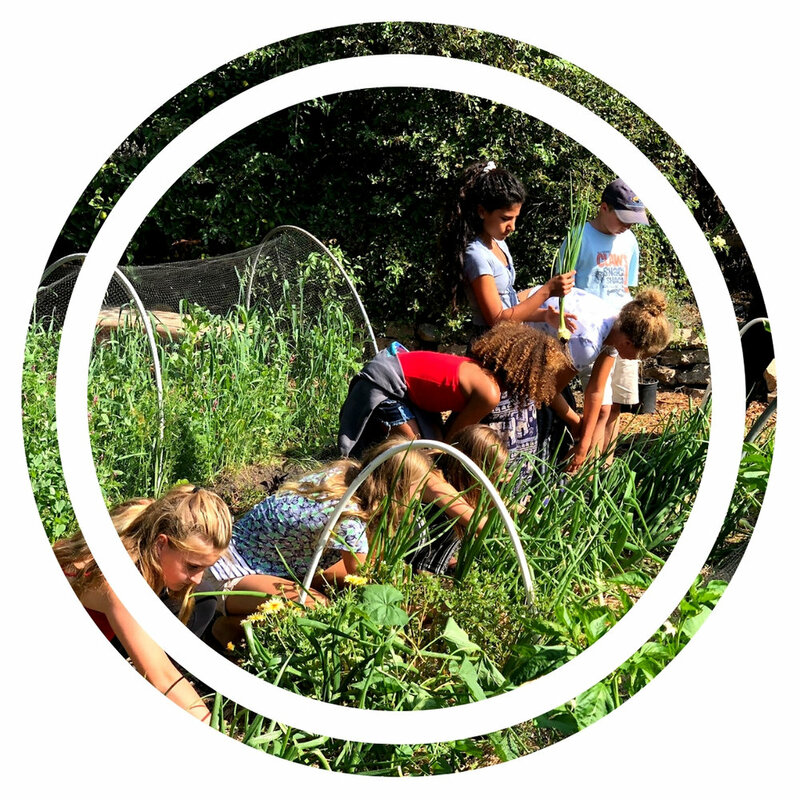 Our curriculum development began with the partnership between WBLT and Santa Barbara Middle School that led to the creation of our Beyond Sustainability curriculum. Last week, on November 2nd, we completed the first elective offering Beyond Gardening, which was held in the school’s amazing, new garden space. The students enjoyed learning how to maintain the diversity of plants and have left with new ecological understandings of the landscapes around them. We look forward to offering our next courses in the Spring! It is our goal to reach every student in our region. We have also been hard at work designing and implementing our Regenerative Land Stewardship Training Program. The WBLT team is assembling a diverse program that will consist of many internationally recognized, regenerative farmers, ranchers, scientists, and educators. It is our goal to offer the most well-rounded regenerative farm training program in Central and Southern California and build the capacity of our region to transition large scale acreage from conventional to regenerative stewardship. To that end, we have sent our internal team up to Chico State to participate in the Soil Health Academy. WBLT will also be hosting two Holistic Management Courses (Grazing and Financial Planning) in partnership with the Savory Institute. These are open enrollment courses. For more information about these courses please click HERE. And stay tuned for more announcements on the training program. There is much more to come as we continue to build the regenerative movement in California! Bulk density is the weight, or mass, per a given volume of soil and is an indicator of how much pore space a given soil has, or alternatively, how compacted it may be. Generally speaking, the lower the bulk density, the more pore space; resulting in higher infiltration rates, available water-holding capacity, plant nutrient availability, plant rooting depth, and microbial activity levels. Texture is one of the master variables regarding soil function. It is a measure of the relative proportion of variously sized mineral particles. While it can not be significantly altered by management, it is important for understanding soil health and for identifying best management practices. Generally speaking, the greater the percent clay, the greater the ability of a given soil to store and exchange nutrients, hold water, and sequester/stabilize organic matter. Soil organic matter (SOM) consists of both decomposed and decaying plant and animal residues and while it is made up of nearly 50% carbon, contains all the plant essential nutrients in a slow-release form. Organic matter is known to increase resistance to pests and disease; resilience against droughts and flood; yields; nutritional quality; and more. While the exact language and metrics for defining soil health are still debated, there is a strong consensus that organic matter management is at the heart of soil health management. Soil pH is considered the other master variable of soil. The pH indicates the level of acidity or alkalinity in a given soil and determines what nutrients will be available for plant uptake. Optimum soil pH ranges from 6.2-6.8 for most crops. Soil pH also is a major determinant of microbial community structure and thus, influences what organisms (beneficial or pathogenic) are able to colonize the roots and the surrounding area. Soluble salts is measured by electrical conductivity and indicates whether levels of salts could present problems with salinity (excessive salt levels) or sodicity (excessive sodium levels). While these conditions can occur naturally, they can also be exacerbated and/or introduced by the use of irrigation in semi-arid and arid regions. Salinity is problematic because it decreases the water potential in the soil, relative to the plant, reducing water flow from soil to plant. The complete nutrient analysis utilizes a variety of extracts to assess levels of plant available macro- and micronutrients. Roots and microbes are constantly releasing acids and other compounds that alter the pH and thus, the availability of any given nutrient at any given time. This analysis covers the three macronutrients needed by all plants (nitrogen, phosphorus, and potassium), the secondary nutrients (calcium, magnesium, and sulfur), and the micronutrients (iron, manganese, zinc, and copper). Over the past month, our team has been working hard to lay the foundation for the install of our new systems. We have been planning our new nursery design, as well as continuing to build our Static Aerated Thermophilic Bioreactor Compost System, which was designed by Dr. David Johnson from New Mexico State University, now working with Chico State University. The process of acquiring and preparing the biomass, and filling the bioreactors has been a point of innovation for our team because we plan on building and filling many of these for years to come. Every time we engage with this system, we are able to reduce our time inputs while maintaining the quality of the final product. Thus far, it has been a valuable asset in our work to regenerate the landscape. At our flagship farm in Summerland, our Apiary provides crucial pollination services, and in turn we feel it's our responsibility to provide a diversity of fodder to support their health and longevity. The Apiary is managed by Nick Wigle and his team from Super Bee Rescue. Since 2009, they have been saving bees that would otherwise be exterminated. Their love and dedication for this important creature inspires us to continue to create the habitats that support the pollinators on which our food systems depend. Thank you for following along on our journey. We would love to hear from you about what ignites your curiosity; are you interested in learning more about the training program? Are you looking to join us as a volunteer? Are you interested in becoming a partner? Contact us below and we look forward to connecting. White Buffalo Land Trust is a 501(C)3 Non-Profit Organization.